Well, it is Sunday and HEAB says time for pancakes! So, I have fallen in love with pancakes. 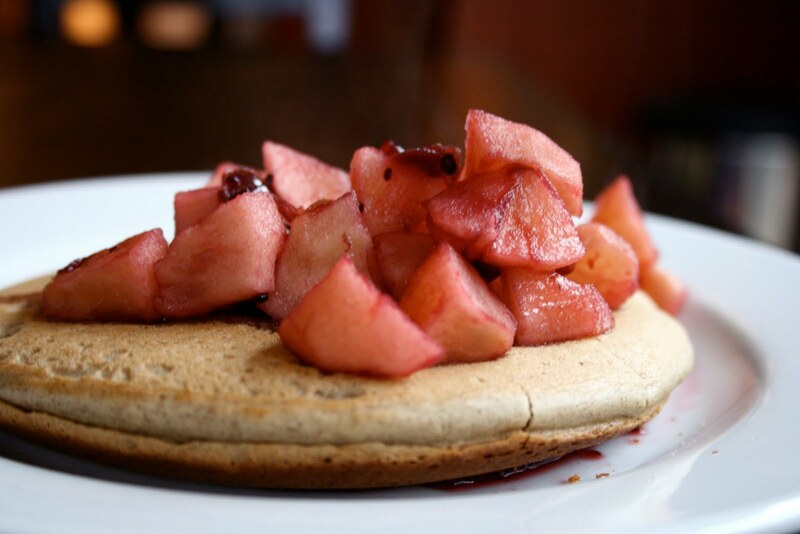 First (food) love oatmeal...second (food) love pancakes. (I had to go back and clarify that since the illustrator is clearly my first love!) I normally incorporate the two (oatmeal and pancakes, not the illustrator and pancakes), but lately I have been playing around with some other high protein flours. I got some almond flour recently and thought it would be fun to play around with some pancakes. Now, when I make pancakes they are all types of thickness, thinness, cakey, creamy...you get the idea. These were very cakey. Like cake/muffin texture. I loved the combination of the buckwheat and almond flour. Buckwheat gives them a cakier texture (and helps hold it together) while the almond flour gives these a nice chew. The flavor combination was so good. I decided to use some of my Crofters Europe microwaved with a firm, sweet Fuji apple as the topper and wow, these hit the spot!!! I loved the sauce the apples and Crofter's made. I really liked the pink color! Very Spring like in color! See the chunks of fruit from the spread? Impressive! Mix everything together and cook in a nonstick griddle. The apple topping was 1 small Fuji apple diced and microwaved for 2 minutes. Then I added 1 TBSP Crofter's Europe and microwaved for one more minute. This mixture would be so good on ice cream too! YUM! I wish we lived closer, I would totally have crashed your breakfast this morning! Those look awesome! Laura, I wish we lived closer for more reasons than that! I would gladly have made breakfast for you guys especially if Chris brought the coffee! Hey, i found your blog today and i've also today, figured out i think i have lactose intolerance! Your blog is a god send as i dont really know what to eat! thanks! love the blog! These look delicious, but the truth is I'm scared of buckwheat pancakes. The first/last one I ate was as a kid and I just didn't like the flavour one bit. But I've matured so I'm sure my tastebuds have too. I'll try them out one of these days. These look seeeriously amazing. 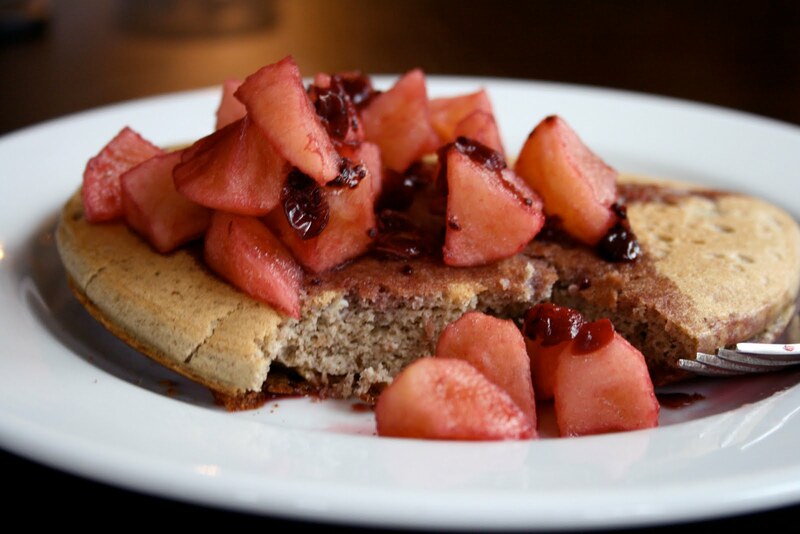 Love buckwheat - oh, and pancakes! I'm a huge fan of buckwheat. 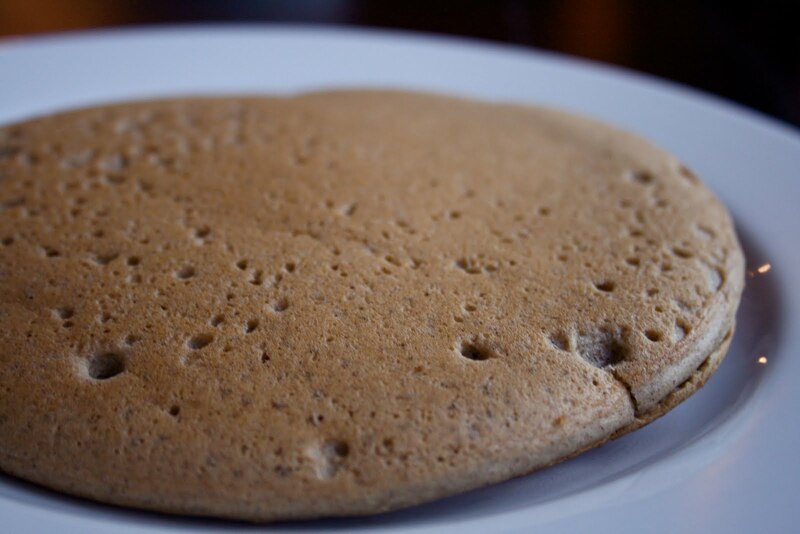 My favorite pancake mix is Hodgson Mill Buckwheat- just so nutty and filling. I love it! Your pancakes look wonderful! i would love to try this homemade recipe- esp the topping! Hi there! Thanks for visiting my blog :) I will have to stop by here more often....anyone who loves pancakes is a friend of mine!! Sarena, those pancakes look divine! I wish my Tony could eat almonds and eggs right now!